The A.7 ECOSTRESS Science Team call "Notices of Intent" are requested by February 27, 2019, and the due date for proposals is now April 23, 2019. The ECOsystem Spaceborne Thermal Radiometer Experiment on Space Station (ECOSTRESS) will measure the temperature of plants and use that information to better understand how much water plants need and how they respond to stress. The ECOSTRESS mission will answer these questions by accurately measuring the temperature of plants. Plants regulate their temperature by releasing water through tiny pores on their leaves called stomata. If they have sufficient water they can maintain their temperature but if there is insufficient water their temperatures rise and this temperature rise can be measured with a sensor in space. ECOSTRESS will use a multispectral thermal infrared radiometer to measure the surface temperature. The radiometer that will be delivered to Houston for deployment on the International Space Station in 2018. The radiometer will acquire the most detailed temperature images of the surface ever acquired from space and will be able to measure the temperature of an individual farmers field. 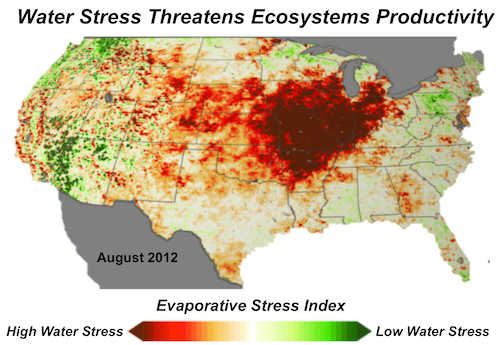 One of the core products that will be produced by ECOSTRESS team is the Evaporative Stress Index (ESI). ESI is a leading drought indicator - it can indicate that plants are stressed and that a drought is likely to occur providing the option for decision makers to take action. The figure below illustrates the ESI for the United States during the 2012 drought. The red areas indicate regions of high water stress. Figure 1. Map of the 2012 drought in the United States showing differences in water stress. Red areas indicate high water stress (drought conditions) and green areas indication low water stress (non-drought conditions).